Ultimate Security Camera - this is a mod that allows you to set security cameras for monitoring and display the image on the monitor. You'll find many uses for this wonderful mod. You can always monitor your own house, or watch the most important places. 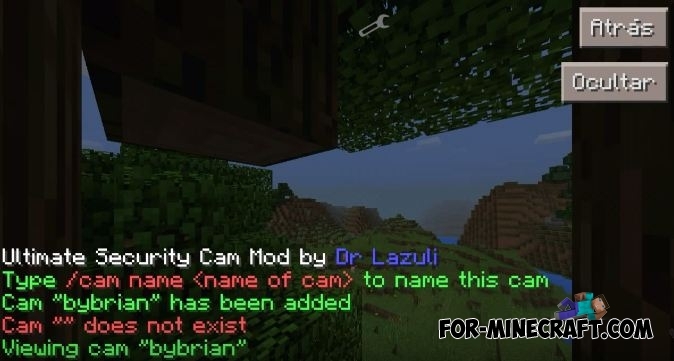 / cam name - Use this to set up a camera! / cam view - Use this to see through a camera! / cam stop - Use this to stop viewing a camera! / cam list - Use this to see a list of all the cameras! Ultimate Farmer Mod for MCPE 0.10.5Ultimate Farmer Mod - this mode will help you become a true farmers' Minecraft Pocket Edition.